EstroSoy™ Plus / 60 Caps - Nature's Way®. EstroSoy™ is made from fermented soybeans with a proprietary process. Fermentation yields more isoflavones and a diversity of supportive nutrients including beta glucan and glutathione. 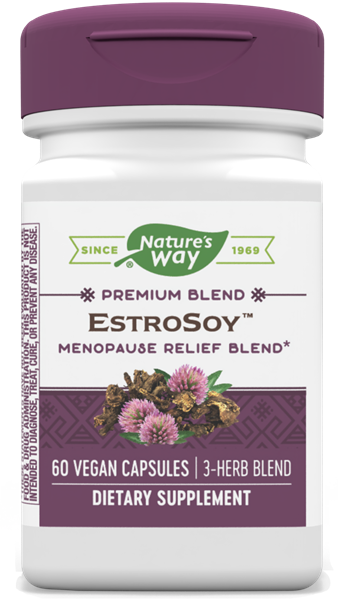 Because EstroSoy contains fermented soy, it delivers isoflavones (genistein and daidzein) in their free, unconjugated forms that are easily utilized by the body. Caution: Do not use if you are pregnant, nursing, attempting to become pregnant, an adolescent female or have a liver disorder. Discontinue use and consult a healthcare professional if you develop symptoms of liver trouble, such as abdominal pain, dark urine or jaundice. If you are taking any medications consult a healthcare professional before use.